The outlook for the industry remains subdued, with many Smaller steel mills struggling with poor operating margins. 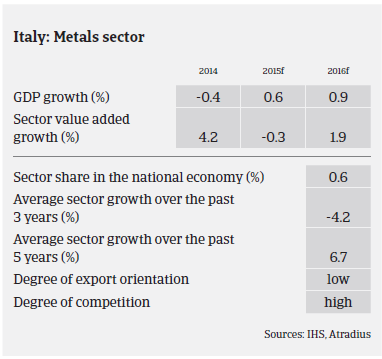 For the Italian economy the metals, and in particular, the steel industry are of major importance, accounting for about 2% of GDP, with an estimated value of EUR 34 billion. The steel sector suffered from massive production and consumption decreases in 2012 and 2013, and this negative trend continued in 2014. According to the Federation of Italian Steel Industries Federacciai, in 2014 domestic production decreased 1.6%, and this downturn continued in H1 of 2015, affecting flat as well as long steel products. All businesses along the value chain, from steel mills to service centres and wholesalers, are impacted by still subdued domestic demand for steel. Among the two steel mills operating with traditional blast furnaces, the biggest one, Ilva, responsible for one third of domestic steel output and Europe´s biggest in terms of output capacity, has been run by a government-appointed commissioner since 2013, after it was accused of failing to contain toxic emissions. In January 2015, the Italian government took full control of the steel mill, which is now operating well below full capacity. Italy´s second largest steelmaker Lucchini, declared insolvent in 2012 and placed into special administration, has been sold to the Algerian conglomerate Cevital. Production in Lucchini’s plant is expected to restart in the coming months. Smaller mills operating with electric furnaces are struggling with poor operating margins driven by flat demand and lower sales prices. However, scrap prices are expected to continue to decrease in the coming months due to weak demand. The Italian steel distributor and service centre segments are characterised by a large number of relatively small companies . After two years of sharply increasing insolvencies, this subsector is on the verge of stabilising due to vertical or horizontal integrations. In the flat steel product segment, the service centres of CLN and ArcelorMittal have merged into a joint venture, ArcelorMittal CLN Distribuzione Italia. Together with Ilva, Marcegaglia and Gabrielli, it will control more than half of the volume of flat steel products in Italy. Additionally, Feralpi has acquired a 48% share in Presider SpA and Metallurgica Piemontese Lavorazioni. Both companies supply and install steel scaffolding for reinforced concrete and all related civil construction products, and represent an example of vertical integration. 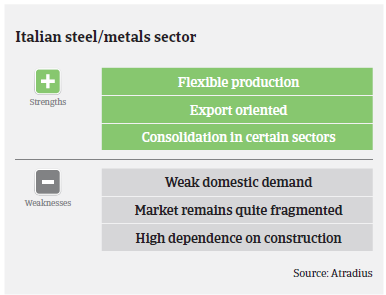 The outlook for the Italian steel industry remains subdued, despite a modest rebound of the economy in 2015. The sector´s future performance is highly connected to the future of Ilva, which is by far the largest steel producer, having great influence in defining domestic market prices. With some success, steel and metal manufacturers have tried to expand export activities in order to compensate for depressed domestic markets. However, the export of long products is mostly destined for Algeria, whose market is expected to mature within the next 4-5 years. 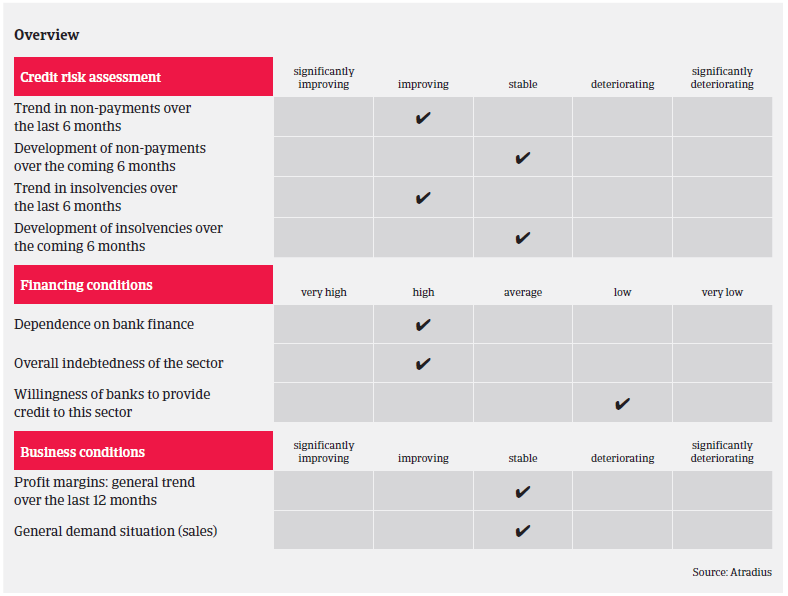 Due to the on-going problems in this industry our underwriting stance remains generally cautious. However, given a decreasing claims trend we are currently more open to new cover than in previous years. While we remain more restrictive in the (mainly construction-related) long products segment and for wholesalers, we are willing to develop business in the special steel and mechanics segment.